That bargain plonk ordinaire that passes as merely drinkable may soon get featured status at your next party. 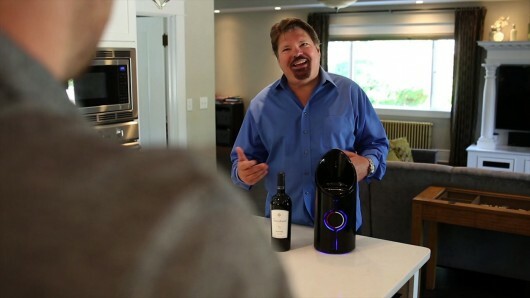 A startup out of Spokane, Washington, has unveiled its Sonic Decanter designed to improve the flavor, mouthfeel and aroma of wine in 20 minutes or less by using high frequency sound waves to break down preservatives, such as sulfur dioxide, transform the molecular and chemical structure of wine, and accelerate the aging process. While these may sound like claims you might expect to hear on a late night infomercial, Michael Coyne, CEO of Dionysus Technology Concepts Inc, (DTC) – named after the Greek god of wine – says the technology is fairly basic, and has been used in the food and other industries at least since he first learned of it in 1983 while working at PepsiCo. While ultrasonic frequencies start at 20 kHz, Coyne says the Sonic Decanter operates near the 40 kHz range using a proprietary frequency delivery method. These sound waves traveling through the liquid are claimed to change the chemical structure and micro-homogenize the components of the wine, breaking down the molecular structure and recombining them in beneficial ways. At the same time, many of the dissolved gases in the wine are released to create new chemical bonds. It’s a similar process to bottle aging, minus the 10 years or so. The steps for Sonic Decanter users are as simple as unpacking the product, filling it with 16 oz (470 ml) of cold water, inserting the bottle of wine and pressing one of two buttons for red or white. Ten to 25 minutes later, according to user preference, the wine is ready for enhanced, pucker-free drinking. And while it may not turn jug wine into Chateau Latour, the process is claimed to improve the quality in several ways. It softens tannins that are typically higher in young wines for better mouthfeel, and produces aromas usually only present in aged or quality wines (i.e, the nose). Flavors are also enhanced, while Coyne says pigmentation can be visibly altered, leading to more golden chardonnays and rubier rosés. The Sonic Decanter process works better on red wines, which have more chemical components and more complex molecular structure than whites. And it works best on full-bodied dark reds, such as cabernet sauvignon, shiraz or Bordeaux, and even ports. For white wines, the process works best on chardonnay, with less improvement on light-bodied varietals, such as Chablis. Unlike low-tech glass decanters that work by exposing wine to air, the Sonic Decanter removes wine-degrading oxygen, and extends an open bottle’s shelf life to days instead of hours. Another advantage of the Sonic Decanter is its Bluetooth-enabled smartphone app for iOS and Android. The app allows the user to choose red or white, and set a time between 10 and 25 minutes. It also signals when the wine is ready to go. The company’s recently completed Kickstarter campaign easily surpassed the US$85,000 goal, allowing for the initial wave of production. If all goes well, the first decanters are slated to ship in May of 2015. The asking price for the Sonic Decanter is $249, though a pre-order special is currently offering the device for $169. And while Sonic Decanter prototypes were made with 3D printers, the product will be built using standard consumer appliance manufacturing methods. The crowdfunding pitch video below gives an overview of the Sonic Decanter.